In today’s multi-cultural world, religious tolerance, a ‘live and let live’ attitude towards different religious groups, is appealing. The Bhagavad-gita strikes an ecumenically tolerant note when it (04.11) declares that all people are on the path to the Absolute truth. Yet tolerance can, ironically, become a form of intolerance when it leaves no room for transcendence. Some people claim that because different religions conceive the Absolute Truth in different ways, there’s ultimately no Absolute Truth – it’s all just relative conceptualization without any root in any transcendental reality. Such metaphysical relativists inflexibly insist that great spiritual seers are also limited to relative perception; they dogmatically deny the presence of any transcendental import in scripture; and they rigidly refuse to practice any yogic processes that can elevate their consciousness beyond the relative material level. While intolerance towards some specific religions can cause conflicts in this world, intolerance towards religion itself sentences one to stay life after life in this conflict-filled world. The apparent championing of tolerance by such relativists masks their insidious intolerance towards transcendence. While intolerance towards some specific religions can cause conflicts in this world, intolerance towards religion itself sentences one to stay life after life in this conflict-filled world. Thus intolerance of transcendence becomes the most spiritually disastrous form of intolerance. 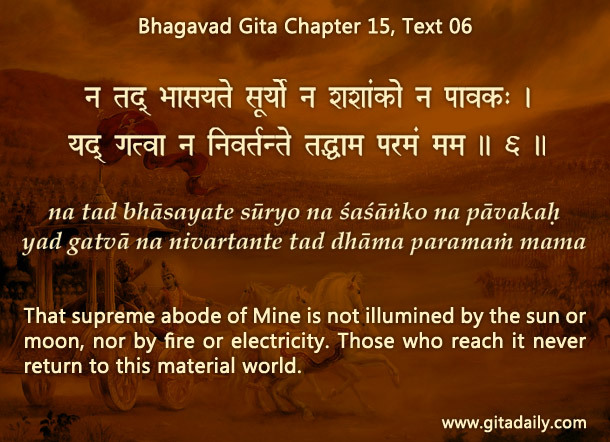 The Gita (15.06) declares that there exists an Absolute Truth who reigns in the transcendental realm beyond our limited conceptions – which this verse avers to by various worldly sources of illumination such as the sun, moon and fire. This transcendental reality can be experienced through purification and grace. The Gita (18.55) indicates that the practice of bhakti-yoga attracts a self-revelation of the Absolute Truth that catapults us to the arena of transcendence. If the devotees of tolerance can just extend their devotion towards transcendence and open themselves to the Absolute Truth, then scriptural wisdom and spiritual purification stands ready to enrich them with fulfilling experiences of the reality of transcendence.